Philadelphia, PA, 28 March 2019 – Authentise (www.authentise.com), the leader in data-driven workflow tools for additive manufacturing, has released a mobile web application for its users. With this tool, Authentise extends its digital thread from the printers, data of which it has already integrated, to every post processing step. The app uses scans of QR codes implanted on travelers to help operators move parts through manual post processing stages such as powder or support removal, inspection, testing and more. This makes it easier for operators to track parts in progress, which in turn allows managers to see order progress and increases detail on traceability report for customers. The data these actions generate can also be used in Authentise’s Machine Learning algorithms to improve time estimates, quality predictions and more. The App will be available as a trial release in the Google Play store next week or via the web. In addition, Authentise released a minimalist traveler that allows additive manufacturing facilities to start the process of going completely paperless. Additional functionality will be released in the coming weeks, including the ability to add attachments such as images and notes to each production step, and the ability for operators with the right permissions to jump and undo process steps. Authentise will be present at AMUG, Booth 37, to demonstrate its workflow tool and app. For some people, “Open” has plainly negative connectations. What open really means is for everyone to weave and participate in an environment that enables learning, interoperability and ultimately makes very much business sense – as we saw in Red Hat’s $33bn acquisition. The maker revolution started as a way to put 3D printing and other technologies in the hands of everyone, democratizing manufacturing and bring about a new wave of STEM pupils. FDM printers were the first but now all sorts of printing platforms are going open. In fact, being open enables businesses to embrace third party opportunities more readily and easily and ultimately brings greater value to the customer. We recently announced the support for the quoting capabilities of Prosper3D within our own platform, something that our customers can keep in mind when creating the best platform for their case. We need to share more of the cool work we do, otherwise most will never see the light of day. We have just closed a crowd-sourcing experiment with Fabbaloo inviting anyone to submit their best 3D printing application, and the most voted got featured in our playing cards deck! The community has so much to give. The 2018 Hackaday Prize will soon be wrapping up, and as always, the contest has yielded some wonderfully innovative and promising ideas. One entry, submitted by Yvo de Haas, aims to make binder jetting accessible to everyone. Binder jetting, in which a liquid binding agent is deposited to bind powder particles together, is an effective method of 3D printing whose benefits include not requiring supports. It’s not a technology, however, that is typically accessible to the average maker. Authentise, the leader in data-driven workflow tools for additive manufacturing, today announced a new partnership with Prosper3D, the provider of accurate quoting solutions for AM service bureaus, to give Authentise customers an even greater choice in tools to manage their workflow. As part of the agreement, Authentise customers will be able to access the Prosper3D quoting engines seamlessly through the Authentise Additive Accelerator interface. Karen Linder shared with us this wonderful application of 3D printed designs that work in combination with engineered material properties. By restoring natural oyster habitats the environment will benefit from biological filtration systems, wave barriers and natural nurseries for fish and other marine life. Presently, 85% of the world’s oyster reefs are functionally extinct. The material employed is plastic-free and is optimized for better larval settlement, survival and growth. Karen’s entry has been voted as the best application on the round and will be included as a new card in the latest update to our playing cards deck. Upgrading to better standards and technologies is becoming easier than ever thanks to their decentralized and scalable nature, giving the opportunity to improve by gradual implementation and testing. There are many avenues of experimentation to consider. IIoT applications can be implemented as small, self-contained units, providing their own power and relaying sensible information where the most valuable data is to be found with a very small investment. Incorporating AM capabilities allows businesses to underpin numerous steps of traditional part production and logistics, assessing ROI that is clear from the start. However, the right software can sometimes be enough to jumpstart operational efficiency immensely, by automating and analyzing machine data with little effort and investment. Authentise very recently started integration of SLM machines data into its 3Diax platform. The digital age of manufacturing enables future-oriented actions to be taken at any business leisure. [Small photovoltaic (PV panels) in combination with Lithium-ion (Li-ion) batteries], two well-proven and synergistic technologies are providing highly cost-effective solutions for both consumer and industrial grade applications, including many connected to the IoT and the IIoT. All sorts of industrial applications are currently deploying PV/Li-ion battery hybrid technology, including GPS sensors and asset trackers, environmental monitoring systems, smart agriculture (monitoring moisture, temperature, and rainfall), marine buoys, and many other M2M and systems control and data automation (SCADA) applications. Read the full article at Sensors Online. 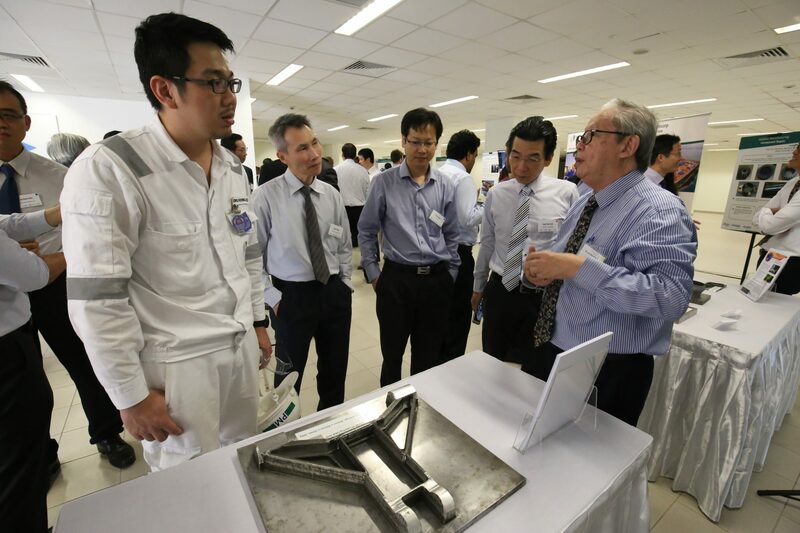 Sembcorp Marine is seeking to revolutionize the offshore & marine (O&M) sector by adding cutting-edge technologies to its shipbuilding and repair efforts. In collaboration with three partners across industry and the Singapore government, the company will develop water-tight production applications with a Digital Twin, AM and drone assistance. SLM Solutions: Cooperation agreement signed with Authentise Inc.
SLM Solutions Group AG , a leading supplier of metal-based additive manufacturing technology, has recently signed a cooperation agreement with Authentise Inc. Software developed by Authentise helps SLM Solutions customers expand additive manufacturing capacities through greater efficiency, transparency and quality in deploying SLM machines. Sandy, UT; 14 Nov 2017 – Authentise, a leader in process automation software for additive manufacturing, today announced that it has connected to and receives data from more additive manufacturing device types than any other software developers. Authentise has worked with a number of additive manufacturing equipment providers, such as EOS or the recently announced partnership with SLM, to connect their devices to the Authentise 3Diax platform and Manufacturing Execution System (MES). Data can now be received from ARCAM, 3D Systems, EOS, SLM, Stratasys, and HP additive manufacturing devices, among others, with more to come. estimates. This reduces cost, improves reliability and increases output. The machine data is also available independently through the Machine Analytics Module of the Authentise 3Diax platform. The Module allows users of additive manufacturing technology to create and use their own additive manufacturing automation workflows or to tie the data back into existing IT systems such as Enterprise Resource Planning (ERP) tools. Machine and software suppliers may also use the Machine Analytics Module to create and distribute their own Industry 4.0 solutions. “ARCAM”, “3D Systems”, “EOS”, “SLM”, “Stratasys” and “HP” Brands and Trademarks are copyrights of their respective owners. Lübeck, 09 November 2017 – SLM Solutions Group AG (“SLM Solutions”), a leading supplier of metal-based additive manufacturing technology, has recently signed a cooperation agreement with Authentise Inc. (“Authentise”). Authentise is a leading US-based provider of software to automate additive manufacturing processes. Software developed by Authentise helps SLM Solutions customers expand additive manufacturing capacities through greater efficiency, transparency and quality in deploying SLM machines. Lübeck-based SLM Solutions Group AG is a leading provider of metal-based additive manufacturing technology. The company’s shares are traded in the Prime Standard of the Frankfurt Stock Exchange. The stock has been listed in the TecDAX index since March 21, 2016. SLM Solutions focuses on the development, assembly and sale of machines and integrated system solutions in the field of selective laser melting. SLM Solutions currently employs over 360 members of staff in Germany, the USA, Singapore, Russia, India and China. The products are utilised worldwide by customers in particular from the aerospace, energy, healthcare and automotive industries. Authentise Inc. offers software solutions facilitating the deployment of additive manufacturing in production environments. The solutions it offers include the 3Diax Modular Platform as well as the Authentise Manufacturing Execution System (MES). The MES utilizes data from additive manufacturing machines to resolve automation challenges, creating a path to fully automated order processing and tracking. 3Diax modules also provide the flexibility to easily adapt such automation to existing work processes and integrate it into already existent IT systems. The software products enable total production costs to be reduced and customers’ product launch times to be accelerated. Authentise Inc. was founded in 2012 in Silicon Valley and is also represented in Europe.